This design is a simple indicator light suitable for just about any motorcycle, it has very few components, keeping cost to a minimum and making it easy to build even if you have limited knowledge of electronics. Instead of a more elaborate voltage indicator which takes up space and will most likely be distracting in the dark with a diode fighting for your attention, this works similar to the type of charge light most cars have (and many bikes with a more detailed instrument cluster.) where the principle is “no news is good news”. A red light comes on when the voltage drops down to battery voltage or below, indicating that the battery isn’t being charged properly, and a yellow light comes on at a high voltage, indicating overcharge. When the battery is being charged at normal voltage, no warning light is on. When a low voltage is applied, the red LED lights up as current flows through it; R1 serves as a current limiter. If the voltage that is applied to the circuit reaches 12 V, the zener diode will start to conduct. The current through the zener diode causes a voltage drop across R2 which opens Q1, and in turn "cuts off" the voltage across the red LED, which will start to dim at around 12.2 V and go completely off at around 12.6 V.
At this point, no LED is lit. This is the normal condition with a healthy charging system. If the voltage increases above 14.6 V, the voltage drop across R4 becomes large enough to open Q2, which makes the yellow LED light up. This led starts to glow very slightly at around 14.6 V and is fully lit at around 15 V, a voltage which is harmful to most batteries. The design can easily be built on a “Veroboard” or stripboard, but if you have some experience with electronics and can make our own PCB’s you can get the size down considerably. The parts are trivial to find and the only small thing to consider is the actual zener voltage of the zener diode, while marked at 11 V, the actual value can vary quite a bit. Obviously a lower zener voltage means that the red light will “cut of” below 12 V and will be ineffective as a warning light, so you might want to buy 3-4 diodes and check their actual value before using them. You will also notice that there is no fuse included in the schematics. Either connect the circuit to an already fused 12 V line (instrument light in my case...) or add an inline wire fuse holder on the positive connector wire. Cut the stripboard to size 8*8 holes is the minimum size, making it bigger migth make it easier to solder. Note the orientation of the stripboard, the strips are horisontal. Make a cut in the metal strip at the red dot. There should be no connection between the two parts. 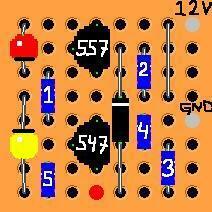 Start adding and soldering components, start with the two transistors and work towards the edge of the board. Note that the transistors, LED's and the diode has orientation, the resistors doesn't. Add the little wire bit that connects two strips (Using a piece of cut of wire from a resistor is an easy way) and the two connecting wires. Figure out if you need (want) a fuse or not (on a VTR the instrumentlight works as a connection point and is already fused, so it isn't necessary). Make VERY, VERY sure that it is watertight! A small plastic container (like the smal plastic ones for film rolls) and lots of hot-glue is a cheap and easy way. A variable voltage supply and a cheap digital voltmeter will make it easy both to check zener voltage of the diode beforehand and the actual voltages for the LED’s after the build, but is in no way a necessity. Edit: Added back images after the server outage. And thanks to fundgh, fixed polarity of the yellow diode. Last edited by Tweety; 11-23-2007 at 06:25 PM. Very nice write-up. Seems like it should work out well. It did work out fine... Thx for the props.. If you could maybe put this more in layman's terms so that the average Joe could build one that'd be super! A pic from the back of it would be helpful as well. Maybe even a step-by-step build article. I've got most of this except the zeners. I might take this on myself since I've been so damned lucky with my R/R so far. The luck will eventually run out, I'm sure of it. Greg, I reworked the whole thing and added a few pic, including a stripboard layout. Hope this makes the whole thing easier to read and understand. Very good, Tweety! With the rash of RR failures lately this is a valuable tool. Certainly knowing the over/under status prior to outright failure might keep you off the side of the road! Good job! Would you consider making a few of these up for those of us without the skill/parts to pull it off? If so what might the cost be? Very good write up. Diodes and transistors can be used for all sorts of cheap and useful items. By the way, I have to ask: Are you a Swede by birth? The reason I ask: Your mastry of the English language is quite impressive. Good project and a very well written article. Thanks for sharing. that is one of the more clever things I've seen and thanks for the write up. Should be very useful. I know nothing about electronics - I think I can follow the instructions though and should be fun trying. Really cool. I think we need a project manager of sourts. Someone to build one here in the states using parts obtained at a common supplier (internet preferably) and put together a parts list. I think the instructions are clear enough. If there was a complete list of parts that could be ordered from one source, we could all by them have our own nifty little voltage warning system. If I undertake the venture I will be sure to document it. RadioShack apparently doesn't have zenerdiodes... ? would Digi-Key work? Your list neglects to list the resistors. Why is that? I am bummed I wasn't more patient to wait for your reply. I couldn't deal with browsing through Digi-key (Mouser was a little easier) web site, so I ran over to the local electronics supplier. It cost me 20 bucks, and I don't have an enclosure yet. I had to buy 20 of one of the transistors because they didn't have a smaller package. I also had to get 2 ZDs and an assortment of LEDs. The parts are far less expensive on-line, but there may be ordering minimums and shipping charges to deal with, so it may be a wash. My buddy is going to show me how to solder such small connections, and hopefully I will have it together and operational next week. If I have spares, and I order some other stuff, maybe I can put some kits together and send them to people who want to give it a shot. With not being able to make this work myself, I've resolved to creat a simple circuit that seems to be doing the job as well. Albeit less complicated. See diagram below. I've built one that seems to be working as intended. The LED on the resistor basically tells you that you have battery. The LED on the 12v zener diode tells you that you are getting charge over 12v. The LED on the 13v zener diode tells you that you are getting charge over 13v. The LED on the 14v zener diode tells you that you are getting charge over 14v. You are basically going to have LED's on all the time though. You should be getting all LED's on except for the LED on the 14v zener, unless you are getting overcharge. You could possibly just have the LED's on 13 and 14v zeners, for a minimalist meter. My small electronics skill are very minimal, but this design seems to be working when I put it on the bike. Someone point out any flaws if seen. Cost would be around $5 for the neccessary components. I can give the exact part #'s if there is interest also. OK, I gave it a go last night, and thought I would give my experiences so that anybody giving it a shot on their own doesn't encounter the same issues. Tweety, it appears that the #5 resistor and the yellow LED are in the wrong spots on your board layout diagram. I actually made the mistake in assuming that was a 9 x 9 board (the picture is of a 9 x 8) and got some of the components lined up wrong. When I went to change them I discovered that things didn't connect the way the wiring diagram shows. I came to the conclusion (granted, I don't know electronic circuit design so I had to make some basic assumptions) that the wiring diagram is correct, but the resistor and LED were just swapped on the board layout. Also, I assume that the red dot on the bottom row indicates that the trace must be cut or stopped so as not to connect the diode and R3 to R5 and the yellow LED. The soldering was actually easier than I thought. It really helps to have the proper tools and materials for the job. The de-soldering wasn't so bad either. Make sure you have soldering wick, or some other de-soldering tool in case you mess something up. I ultimately de-soldered the entire board and will try again today. Tweety, let me know if these mistakes I pointed out make sense or if I am looking at it wrong. Alright, I have gone through the steps and the darn thing is not working correctly. I have adjustable power supply that I am using to test it, and can't seem to make it work as designed. The first thing I found is that the layout drawing depicts the transistors in a position that was incorrect for the transistors I bought, so care must be taken that each leg is connecting to the correct components. After messing with it, I could get the red light to turn on at the diode's rated level, but I can't get the yellow light to turn on. Prior to discovering the issue with the transistor orientation, both light would turn on and stay on all the way to 20+ volts. I may have a bad component or an incorrect component as I purchased my parts at a local electronics store and the items were cross referenced. Has anyone else tried this yet? Tweety, is it possible that something else is going on in the circuit? Are the LEDs connected correctly? They have a polarity. If they are installed backwards they act as a diode and will not light up. Everything was connected according to Tweety's diagram. As I previously posted, I found that the diagram had a couple of mistakes. I am actually wondering if the circuit has been assembled by anyone else and tested. 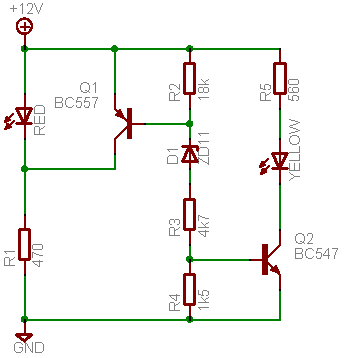 If the circuit works as intended and drawn, I may have a bad component, or a questionable solder joint. I did however assemble this with a former "Fiber-Optic circuit board test engineer" who is professionaly certified in soldering much smaller circuit boards than this, and the trouble shooting was being done by our electrical engineer at the office. Of course he says, "what you could do,...(insert super nerdy electro-techno speak here)" . The LED orientation is a good point. In fact I question the schematic's indicated orientation for all of the components. The transistors had to be turned around, so I am wondering what else needs to be turned around. As far as I can GUESS, the wiring diagram is more correct than the board layout drawing. Tweety....Are you out there? Do you have any suggestions for me? My current status is: Both lights would come on at 2volts and stay on to above 18v. I then found that the orientation of the transistors was wrong and turned them around. Now the yellow light will come on at the Zener voltage (I tried it with a 6v and a 12v and both worked), but the red light never turns on. If the LEDs come on at all they are installed correctly. THAT, I know. Not much else I can help you with though. I'll try to print this out and ask some of the nerdier guys at work about it on Monday. Not trying to hijack here, but giving an alternative along the same lines of the original post. I'm out here!!! Sorry!!! I completely spaced on this thread! The diagram is 100% correct, double and triple checked...! The resistor 5 is in the correct position as it's not important weather it's before or after the diode as long as the diode is oriented correctly. Sorry about that one! BTW I'm guessing any images you had also got lost when the server had a hissy fit... Could you reload them? Pics of the unit on the bike? Does anyone have some images of the indicator lights mounted on your bike? Sure wish I could speak seven languages! Sure wish I could get a girlfriend and then learn her language. Your non-verbal communication skills must be sharp, too!